There's something about September that makes me nostalgic... I suppose it's because this time of year signals a transition that harkens back to school days. While summer is my fave, change is in the air come autumn. And perhaps this year more than others, I need to remember that change has its merits. You see, as much fun as the wedding was, the joy it brought was tempered a bit by the fact that earlier in the summer both my mother and mother-in-law passed away within a few weeks of one another. While neither loss was completely unexpected, the absence of special people in our lives knocks us back a peg or two. While sorting through belongings, I found that while it's not the easiest thing in the world to do, the dismantling of a life can be bittersweet. I kept coming across things I had given to each of them over the years. I'd forgotten many of the handmade Mother's Day and birthday cards and how pleased they were to receive them. Isn't it funny that no matter our age, we still appreciate that parental pat on the head? 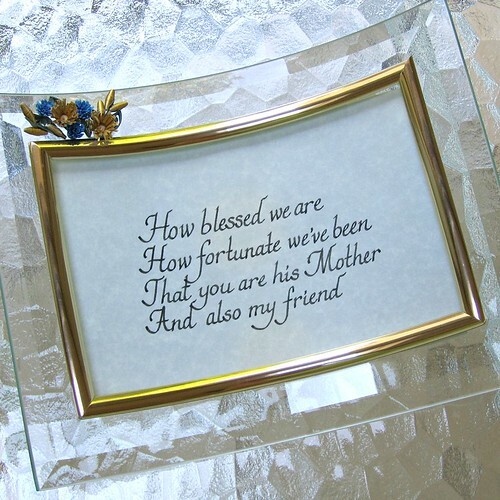 I remember finding these curved glass frames at Target ages ago and thinking they were the greatest thing since sliced bread... the addition of a hand-lettered quote and some of my earliest quilling - bam, a gift. This one was for a friend who moved away... she and I would often walk together at Longwood Gardens. Now I look at the suspect flower arrangements, clumps really, and wonder what I was thinking! Ah well, the sentiments were sincere. 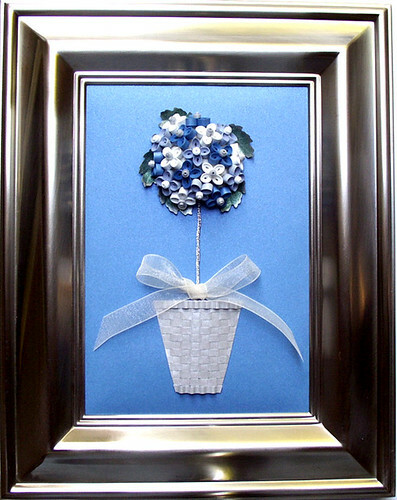 It was the era of twee bows too, judging by the Mom card up top and this quilled topiary tree circa 2005. I brought it home from my mother-in-law's house with the thought that I would upcycle the frame for another project, but then had the idea to see if I could remove the securely glued bow. Believe it or not, I was able to peel the entire tree and woven paper basket from the pearlized backing - yay for a slick coating - and then glue it onto a new piece sans bow. It's more to my liking now, but seems a little empty. Like my heart. Prayers and thoughts go with you on the loss of two special people in your life. 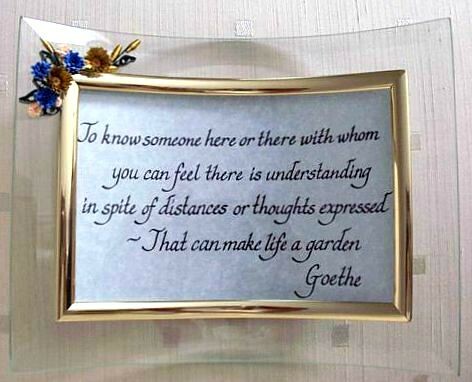 My own mother and mother-in-law have been gone many years, but I still feel the empty space they left. Thanks very much, Traci, and the same to you. Condolences on your losses. Never easy, even when expected. I am amazed at the 'younger years' of my quilling and the now. Not a whole lot of difference, but some...I'm TRYING to get better. Love quilling and I love your site. Thanks for sharing your heart! Thanks HalfWhit, that's so nice of you to say. My condolences as well...The loss one feels can be measured by the love shared. Your quilling is very lovely. Isn't it amazing what little strips of paper can become! I do have a question, however, and am not sure if anyone will be able to help. I am having a table at a local Christmas craft sale and am wanting to sell some quilled ornaments, but when it comes to trying to determine a price I am totally lost. Can anyone provide some guidance as to how put a price on a snowflake? So much per diameter inch/as per how many pieces in the ornament? Any help would be appreciated. Thanks for the great site - I visit it quite often! Thanks very much. 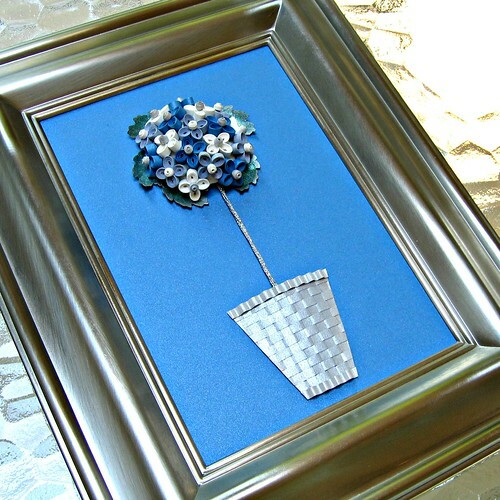 Quilling - especially a snowflake - is one of those very difficult to price items as they are so time-consuming to make. Most people only see that the supplies are inexpensive so think the price should reflect that. I did a search at etsy.com and see that snowflakes are generally priced between $7-20 each. If they are beautifully made, 2 or more inches across and packaged in a quality box, I would charge $20-25. Thank you Ann - You have been a great help. 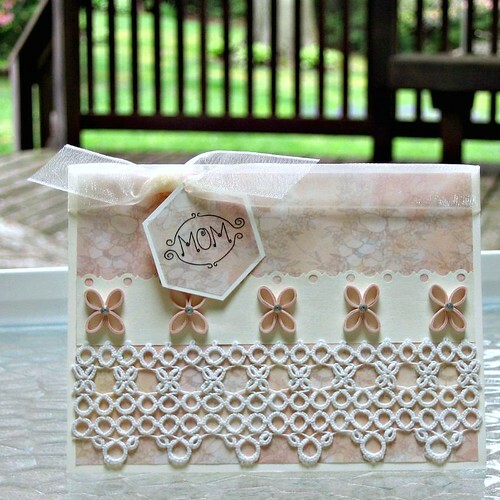 Pretty Quilling and love the sentiments. I agree with you ,No matter how old we are our parent's love always make us feel special.My prayers go with you Ann. Thanks so much, Suganthi. You are such a dear. So sorry to read of the loss of two special ladies in your life Ann. Am sure they kept the cherished gifts because of the love they were made and given with. What a great feeling you must have to have been able to show your love for them with such gifts. Thank you for your very kind note, veecee.